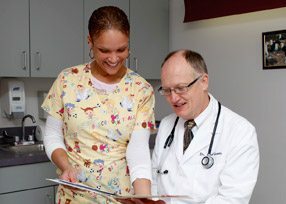 For over thirty years ASA has been providing quality healthcare in the Merrimack Valley. Compassion, expertise, and state-of-the-art technology has made ASA stand out as a premiere surgical practice. We utilize the newest technology to perform many surgical procedures. Breast biopsies can sometimes be done in the office using a needle and an ultrasound machine, reducing the need for a trip to the operating room. Minor procedures to treat problems such as hemorrhoids or skin lesions can be done in the office as well. Laparoscopic surgery, which is minimally invasive, can be done for hernia repairs, gallbladder removal, and colon surgeries. With this approach to surgery comes a much quicker recuperative period. We also have continuous 24 hour coverage within our group. Combine these with a caring and confidential atmosphere, and your experience with ASA will be a pleasant one.